Hear What Residents Say About Their Roads To Retirement. Where Wellness Has A Home. Senior lifestyle with a spectacular view. 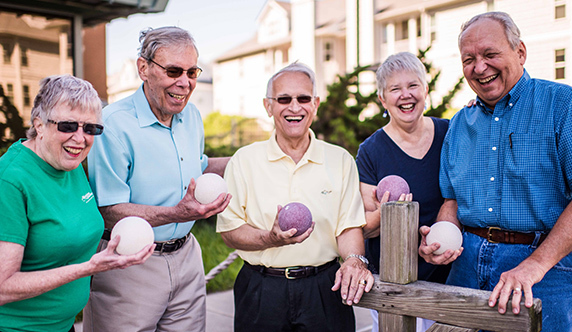 What makes our wellness lifestyle for active seniors work so well (besides our events, our staff, and our full-service community) is our location: Virginia Beach. The Chesapeake Bay. Vacation environment. Family-friendly atmosphere. It doesn’t get much better than this, and isn’t that what you deserve? And to create even more opportunities for intellectual engagement, we’ve partnered with Virginia Wesleyan University to form the Westminster-Canterbury Lifelong Learning Institute. The partnership allows residents to audit select classes at VWU for free, and attend cultural and sporting events at no charge. (If the NCAA requires that students pay a fee for sports playoff tickets, residents will pay the same fee.) 64 fascinating mini-courses will be offered each year at Westminster-Canterbury, coordinated by a VWU professor. Request more information or Call us today at 800-753-2918.